Thirty hours. It’s just over one day, but in that short time, more than 7,000 kids will die of hunger-related causes. The question is: will you care enough to let their hunger move you to action? Inspired by the love of God, you can join the fight. To keep kids alive. To give food to all who go hungry. To hunger for justice. When you do the 30 Hour Famine, you’re opening your eyes to the reality of global poverty. The funds you raise will bring hope to hungry kids: your brothers and sisters in the family of God. ... what does the Lord require of you but to do justice, and to love kindness, and to walk humbly with your God? Text 2019STUDENT to 44888 to get sneak peeks, encouragement, and ways to prep for your Famine! Ready to become a world changer? The funds you raise will change lives. Literally. Our way of saying thanks — your way to keep raising awareness. Sign up to do the Famine, and you can earn all kinds of cool Famine gear when you hit these fundraising goals! You’ll remember the good times you had and the lives you helped change whenever you sport these rewards. 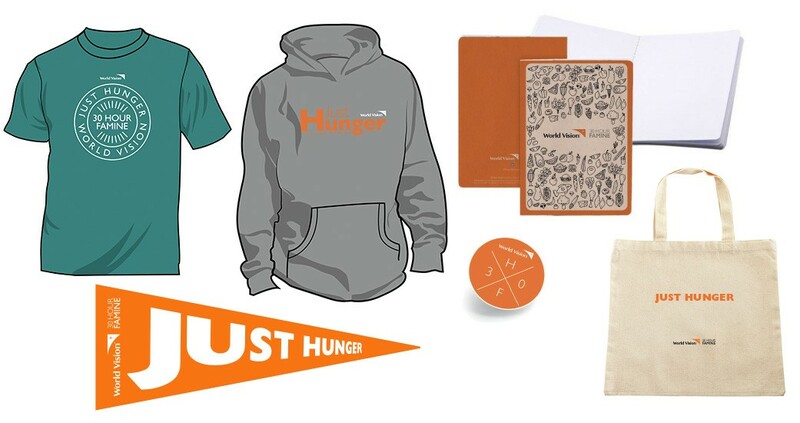 Feed a child for three years and earn all of the above plus a Famine hoodie!